This blog was originally published in 2012. Because it's so popular, we decided to update it for you. Enjoy! 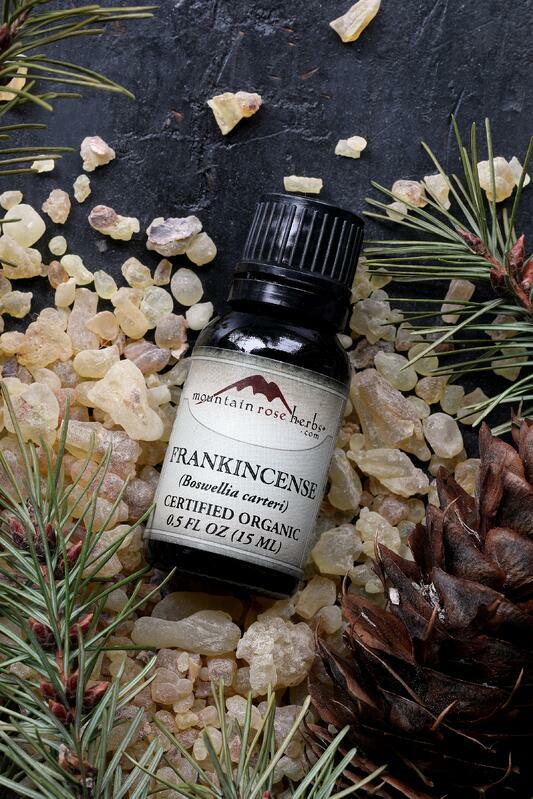 Many of us here at Mountain Rose Herbs are big fans of frankincense and its fresh and grounding aroma. While most folks are familiar with the essential oil these days, there are actually a few different ways in which you can enjoy the wonderfully unique aroma of frankincense. What Is Frankincense and How Is It Made? Frankincense, also referred to as olibanum, is an aromatic resin collected from trees in the Boswellia genus. This beautiful resin was once one of the most important trade items in the Middle East. Ancient societies used it for a variety of ceremonies and embalming practices. To this day, it is still widely used as incense all across the globe. To properly harvest frankincense, incisions are made into the bark of the tree, and the resin is then left to slowly seep out of the tree for a number of weeks until it solidifies. Once the sap is dry, it is harvested from the stems and trunks of the trees. This takes place during the dry season to ensure that it’s ready for harvest. The result is a pale white to deep yellow resin, known as frankincense tears. Our frankincense resin is certified organic and sourced from the Somaliland region of Somalia. Resins have been collected in this area for thousands of years, starting with ancient Egyptians. The collectors deeply understand the risks of overharvesting. This is their livelihood, so they are committed to preserving biodiversity and supporting endemic species in the remaining forested lands. 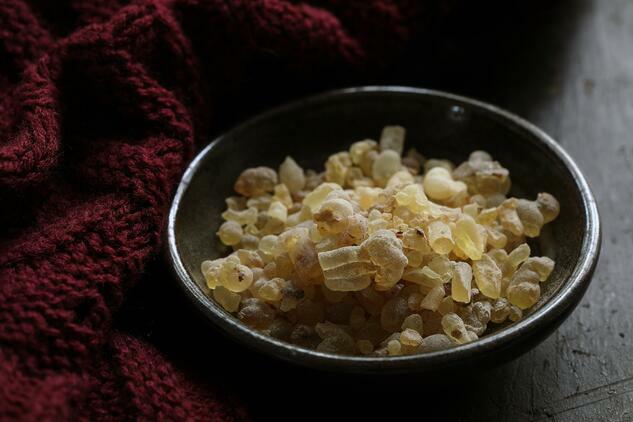 Frankincense resin is traditionally burned to create an aromatic smoke, also known as incense. To do this you'll need a heat safe dish. I like to fill my dish with a layer of sand. You'll then need to evenly light a piece of charcoal. Be sure to do this with heat safe tongs, as the charcoal gets very hot. Once the charcoal is lit and sustains a nice even glow, place a few tears of resin on top and watch them slowly burn, releasing the pleasant aroma. TIP: Adding a thin layer of fine salt to the charcoal before adding the resin helps the resin burn more evenly and smoothly, giving you a much cleaner aroma. We made this sweet video to show you how to burn resins the traditional way, with charcoal: How to Burn Tree Resins for Incense. The essential oil is pure and potent, produced by steam distilling the oleo gum resin. It’s often used in diffuser blends or body care products and perfumes. We source our organic frankincense essential oil from Somalia, the heart of frankincense country, where the highest quality resins come from. Many of the Boswellia tree groves in this area have been tended to by tribes for thousands of years. The essential oil has a unique, woody and balsamic aroma, with top notes of citrus and spice. It blends beautifully with a variety of oils including bergamot, cinnamon, patchouli, pine, and ylang ylang. Of course, it can also be diffused on its own, for a fresh, clean aroma. Looking to use it in some DIY body care goodies? Try making this Frankincense and Myrrh Hand Balm for a real skin treat during the cooler months. 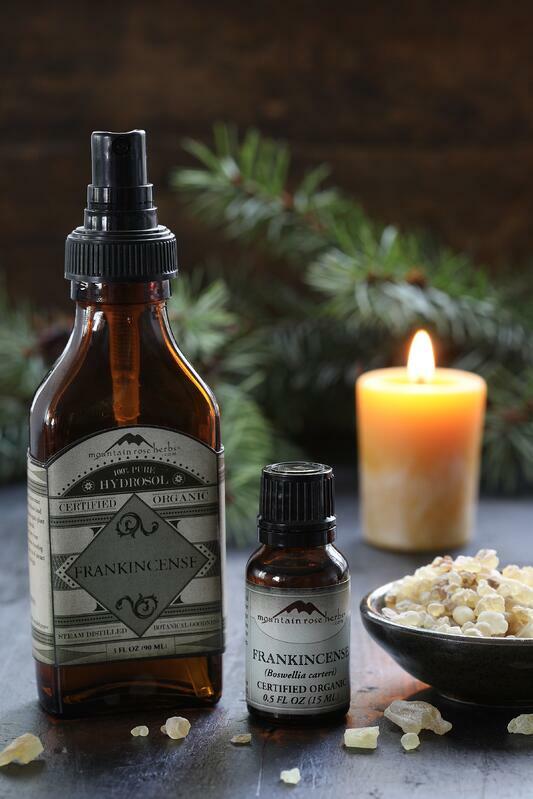 Frankincense hydrosol is created through hydro distillation of the resin tears. The hydrosol is often used to make room and body sprays or added as a water based ingredient in a variety of body care products. Unlike the essential oil, it’s a lot less potent and can be used straight out of the bottle without diluting. The resin used for our hydrosol is hand-harvested with care in Somaliland, and distilled by our trusted distillers here in the US. Spray the hydrosol on its own to freshen up a room or add it to your own unique, hand-crafted body spray! Please note: As with all essential oils, never use them undiluted, in eyes or mucus membranes. 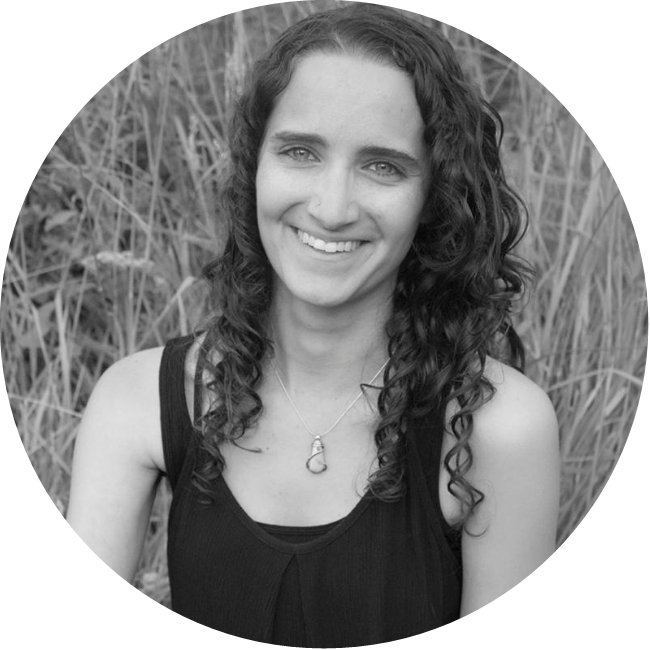 Do not take internally unless working with a qualified and expert practitioner. Keep away from children. If applying an essential oil to your skin always perform a small patch test to an insensitive part of the body (after you have properly diluted the oil in an appropriate carrier).